12 Dec 2018 / 10:46 H.
THIS holiday season, soak up the festive cheer at Resorts World Sentosa where a multitude of festivities for the whole family await! Join favourite characters in the largest-ever Christmas parade at Universal Studios Singapore’s A Universal Christmas, or explore Southeast Asia’s first Glowing Ocean brimming with glowing sea animals and stunning light art installations at S.E.A. Aquarium. While outdoor-lovers can have a splashtastic Fun In The Sun with Instagram-worthy food-themed floats and exhilarating water games at Adventure Cove Waterpark, while manga and anime fans can follow the adventures of Luffy and his crew of Straw Hat Pirates in “Hello, ONE PIECE!”, a first-of-its-kind exhibition at The Maritime Experiential Museum. 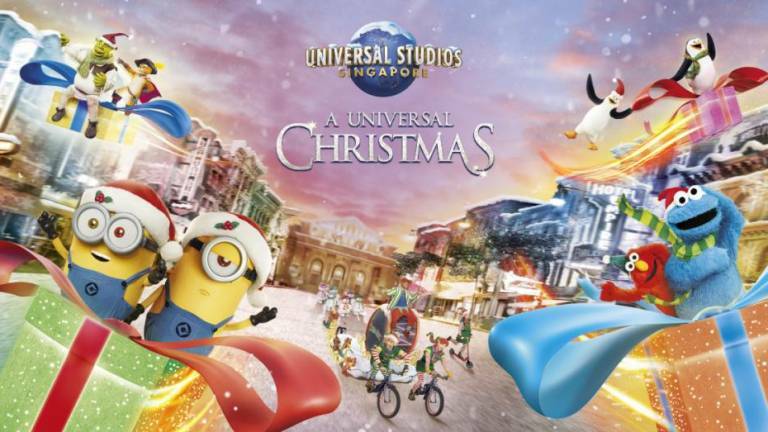 A Universal Christmas returns to Universal Studios Singapore with a full repertoire of experiences including dazzling light displays, all-new musical performances and spectacular fireworks. Park hours will be extended till 9pm and 10pm on select nights, in addition to adrenaline-filled rides and world-class attractions at the theme park. Taking centre stage this year is Santa’s Snowy Sleigh Ride, which returns as the largest-ever Christmas parade in the history of Universal Studios Singapore. The colourfully flamboyant parade will feature a procession of wildly embellished floats and over 50 merry characters including elves, toy soldiers and jolly old St. Nick himself. At nightfall, the parade culminates in Santa’s Christmas Light-Up Party on New York Street, where guests can expect a brilliantly-illuminated show with stunning projection mapping, snowfall and favourite characters such as the Minions, Sesame Street friends, Shrek and Princess Fiona – all decked out in Christmas outfits! Over at the Hollywood Lagoon Stage, guests are invited to a brand-new production titled PRESENTation Day which tells the heart-warming story of Evie Evergreen, a toymaker elf determined to bring back the true meaning of Christmas in today’s tech-obsessed world. Follow the quirky cast of elves in this original musical filled with singing and dancing acts that will delight audiences. This year, guests can embark on an interactive Christmas adventure at the bustling Elf Town in the Hollywood zone, where hardworking elves are in full-swing this holiday season. Kids can get a sneak peek into Bristles T. Evergreen’s toy-making station and help him complete his toy for PRESENTation Day, or find out if their loved ones have been behaving at Chief Chester Chestnut’s Naughty-or-Nice O’meter! The yuletide celebrations continue throughout the theme park with Make A Christmas Date with Marilyn Monroe and sing along to familiar tunes, or dance along to the best holiday hits at the all-new Turntables show where guests can even pick the next song in the set list. The whole family can catch Oscar’s Grouchmas at Pantages Hollywood Theater and follow the story of Oscar, as he transforms from a Christmas grouch to the holiday’s number one fan. Guests can explore five multisensory zones inspired by the wondrous world of luminous marine creatures. Begin the adventure at the interactive Glow Room to discover the difference between biofluorescent and bioluminescent animals, and pen down conservation wishes with glow-in-the-dark ink. 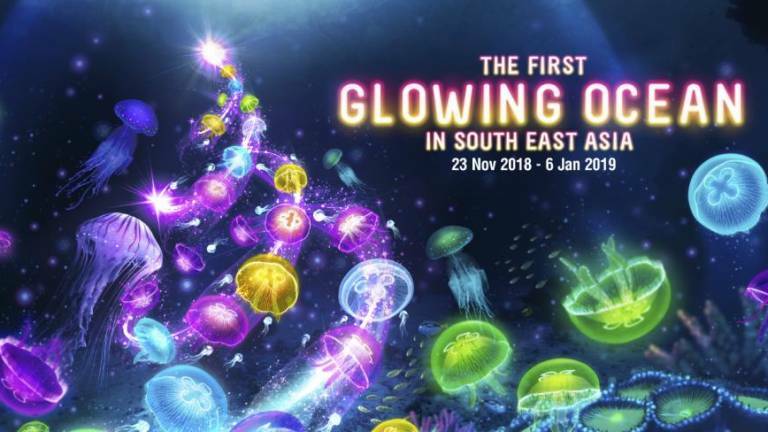 Over at the Crazy, Colourful Corals zone, guests can gaze in wonder at the aquarium’s coral colonies which fluoresce under ultraviolet light at the night reef habitat, or step into an immersive art installation inspired by flowing coral tentacles. For the first time, S.E.A. Aquarium will introduce an underwater appearance with divers in specially customised LED suits as they swim alongside 40,000 marine residents such as majestic manta rays and zebra sharks at the iconic Open Ocean Habitat. In addition, crowd favourites such as Scuba Santa and Elves will make a comeback with their cheeky underwater antics as they dive amongst fishy friends. 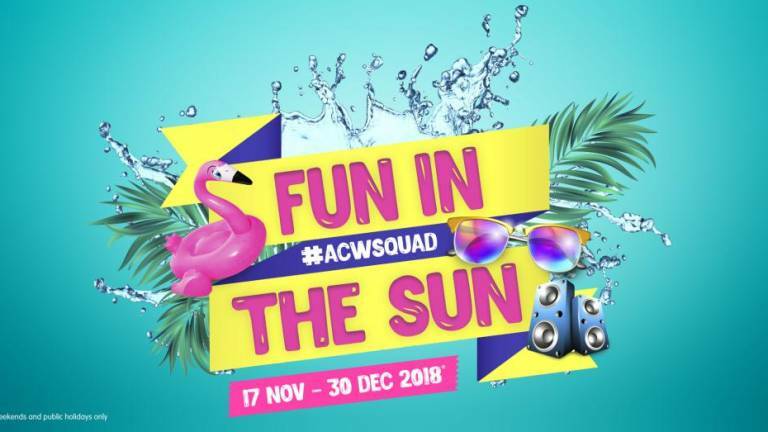 On weekends and public holidays from Nov 17 to Dec 30, 2018, outdoor lovers and thrillseekers of all ages can have Fun In The Sun at Adventure Cove Waterpark. 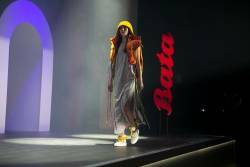 Highlights include a Food Fight that will feature larger-than-life food-themed floats at Bluwater Bay that will create a wave of excitement and a splash of colour on everyone’s Instagram feed. Thrill-seekers can pit their competitive skills against each other in games like Water Wars, a lip sync battle while balancing on giant floats and many others, while grooving to the beats of the resident DJ. 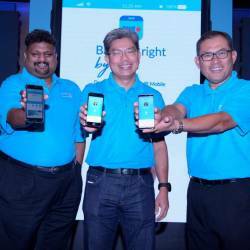 Guests can also take part in an Instagram contest and stand a chance to win attractive prizes such as premium ZoukOut tickets and action cameras. Popular Japanese manga sensation “ONE PIECE” will be docking at The Maritime Experiential Museum for a first-of-its-kind exhibition in Singapore titled “Eiichiro Oda presents Hello, ONE PIECE Luffy is here!” Fans can join Luffy and his crew of Straw Hat Pirates and embark on a high seas adventure at the museum. The exhibition introduces guests to the colourful world of ONE PIECE, written and illustrated by Eiichiro Oda. 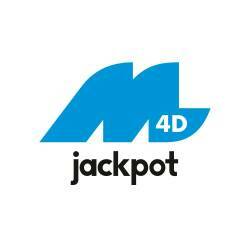 Fans can explore four sections, each covering a unique aspect of Oda’s work. These include a zone which features an exact replica of Oda’s desk, and a virtual reality zone where guests can experience jumping into the mind of Eiichiro Oda and gain a first person perspective of ONE PIECE characters being drawn and brought to life by him.